Today we had another great cooking session at Families Go Wild! We thought it was a good time to celebrate our first harvest from the sensory garden - garlic - so we made our very own Garlic Bread from scratch! We started by washing our hands, and then it was time to make the dough. We added yeast, salt, and oil to a bowl of flour, and gradually added water until we got the right texture. We used quite rough measurements, so we had to add a bit more of certain ingredients as we went along, until the dough was stretchy and rolled into a ball. As we were mixing the dough, more volunteers arrived, which was perfect, as there was more to be done! The next task was to make butter! We did this by pouring double cream into jars and then shaking them really, really hard. We had to pass round the jars quite a bit, as it was pretty tiring! Finally, cream separated into a liquid, and a solid. The liquid was buttermilk, which we didn't use, and the solid was butter! Quite a few of us realised that we didn't know how butter was made. It made us think about how much work goes into the food that we buy, before it even gets to the shelf at the shop! While we made the dough and butter, another family volunteer chopped up our lovely homegrown garlic. The cloves separated beautifully, and smelled amazing! We mixed the chopped garlic into the hand-shaken butter, and spread it on our flattened dough. We each took turns to bake our garlic bread in the pizza oven, and waited patiently for each others' to cook. 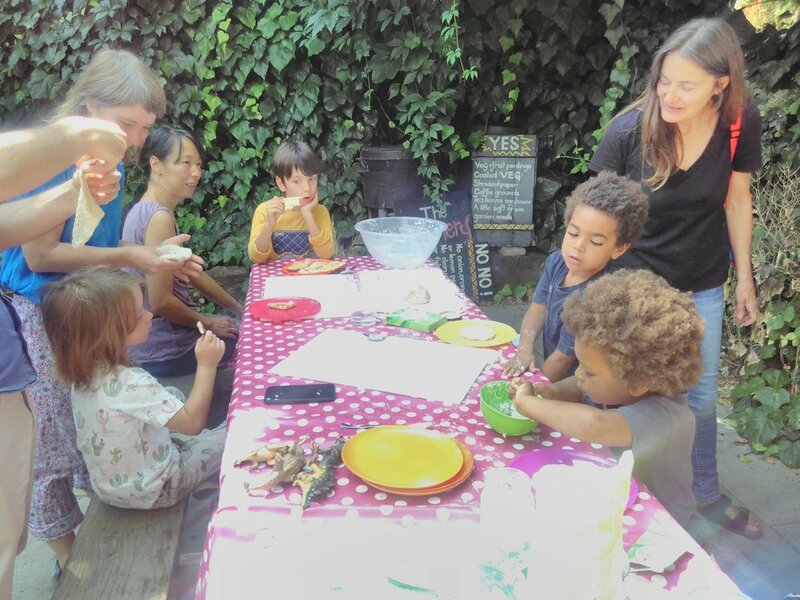 We all love garlic bread, and adults and children alike were very excited to be making and eating some of our own!